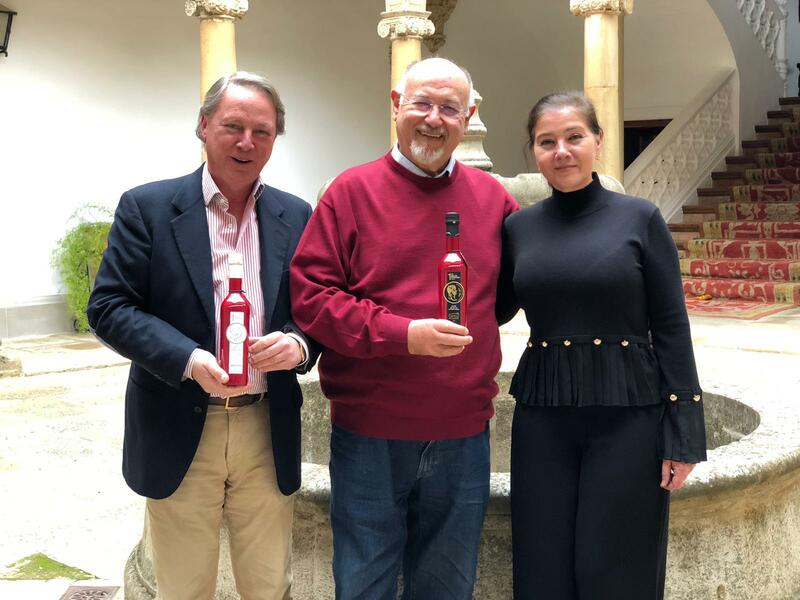 In its ongoing pursuit of excellence, Castillo de Canena, a leader in the field of haute cuisine that produces some of the finest extra virgin olive oils in the world, now launches this 13th annual limited edition of its iconic First Day of Harvest oil. This product is anxiously awaited throughout the year. 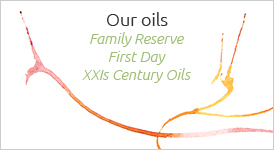 A pioneer in its category, it stands out among top-shelf oils for the care with which it is obtained as well as its aroma, flavour and quality. 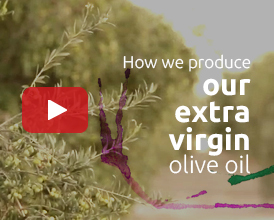 To obtain these prized extra-virgin olive oils, Castillo de Canena works with precision agriculture. Using cutting-edge technology, the company can scientifically supervise the physiological situation of its olive trees in real time, and respond to their needs throughout the seasons. Precision agriculture also permits the company to determine the exact day upon which to begin the harvest of each varietal, not a minute too late or too soon for optimal ripeness. 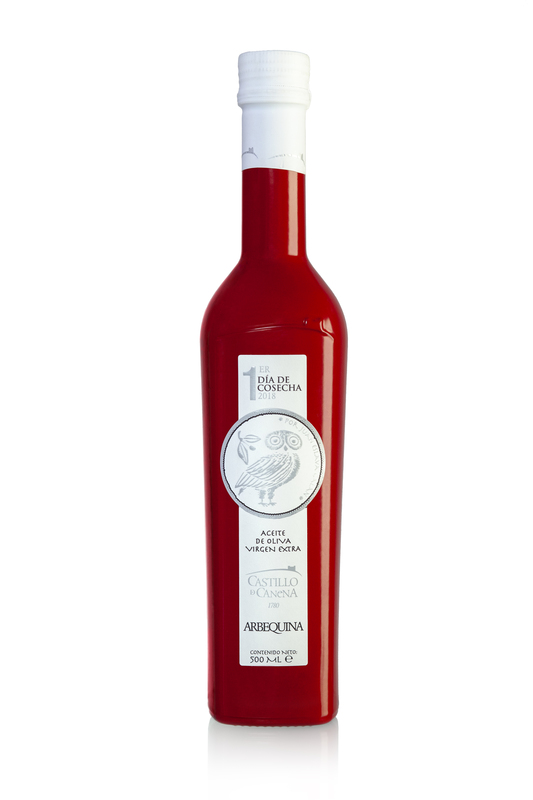 As in each of the previous editions of this line, Castillo de Canena has invited one person from the worlds of culture, art, sport or science —who is also an appreciator of fine olive oil— to design the label that accompanies the characteristic cherry-red bottle of this oil. 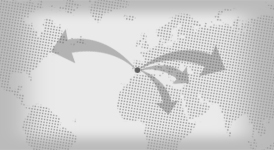 In previous editions personalities like Sara Navarro, Enrique Ponce, Joaquín Berao, Ainhoa Arteta, Manolo Valdés, Pau Gasol, Alejandro Sanz, Fernando Alonso, Roberto Verino, Raphael, Álex de la Iglesia and Sara Baras have participated. On this occasion, it is the writer Juan Eslava Galán that has created the new label that, for the first time in the 13 years of history of the First Day of Harvest line, will feature a different design on the Picual and Arbequino bottles. The winner of the 1987 Planet Award has chosen to emboss two Roman coins from Imperial Hispania on the labels. For the Picual First Day of Harvest oil he has chosen the bust of Emperor Hadrian, for the Arbequino First Day of Harvest he has opted for the owl of the goddess Athena (known to the Roman world as Minerva) together with an olive branch. “Since time immemorial the First Day of Harvest has been an occasion for special celebration in the Mediterranean world of the olive tree. On this holy day, the Greeks consecrated the harvest to Athena, goddess of oil and wisdom, and with the olives collected by the joyful pilgrims they pressed the first oil, which was consecrated to the divinity: burned in the lamps of her temple and consumed in the ritual banquet of her adepts. This memory has been transmitted through all the diverse cultures that honor the olive, and reaches our times with the fervor and festivity of its origins,” the writer explains. Juan Eslava Galán, son and grandson of olive-growers, was born and lived his early years at the olive-mill in Arjona (Jaén). Among his prolific writings, which include eighty books on various topics, we may highlight three books on the world of olives and oil, particularly Un jardín entre olivos (RBA, 2004). Winner of the Planet Award in 1987 for his work En busca del unicornio (In Search of the Unicorn), Eslava Galán has also received other notable prizes such as the one awarded by the Athenaeum of Seville (1991), the Fernando Lara Prize (1998), and the Andalusian Critics’ Award (1998). He holds the Andalusian Silver Medal of Honor and sits on the Board of the Institute of Studies of Jaén. His work has been translated into various European languages. The release of the design created by the writer Juan Eslava for the 13th edition of the limited collection First Day of Harvest coincides with the honors Castillo de Canena has obtained in the most recent edition of the prestigious and internationally recognized guide Flos Olei. 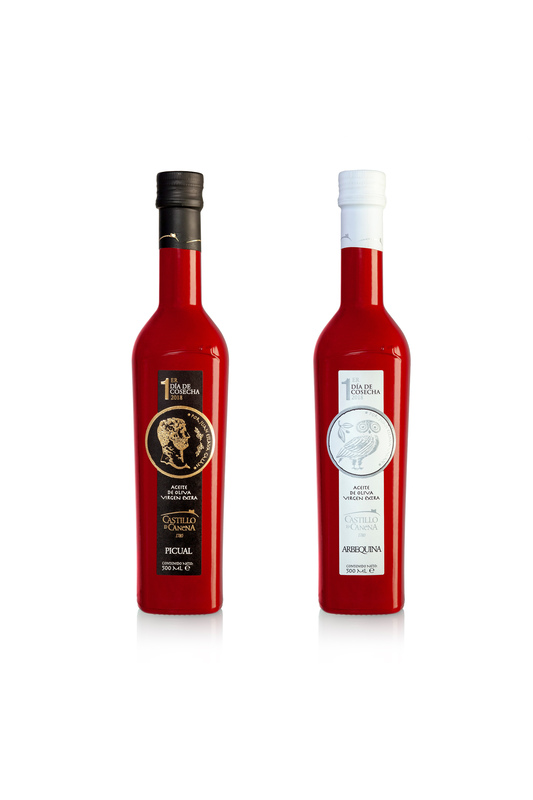 Flos Olei 2019 just selected the extra virgin olive oils made by Castillo de Canena as the finest in the world for the seventh year in a row, giving them the highest possible score (99/99 points). 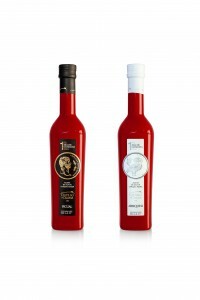 This achievement positions the Castillo de Canena extra virgin olive oils among the top 20 in the world. First Day of Harvest is the extraordinary result of a whole year of effort by the olive-growers, and an homage to the mystique of the very first pressing of the harvest, with all its magic and joy. “Only someone that perceives the magic and the beauty of the olive tree and its environment, and that understands the effort and attention that the harvester lavishes upon his orchards year after year in order to achieve the most fragrant, complex and balanced olive juices, is capable of expressing—in the limited space of a label—a synthesis of all the emotions and passions that characterize the special day on which the first olives are harvested,” affirms Rosa Vañó, Director of Marketing and Sales for Castilla de Canena. 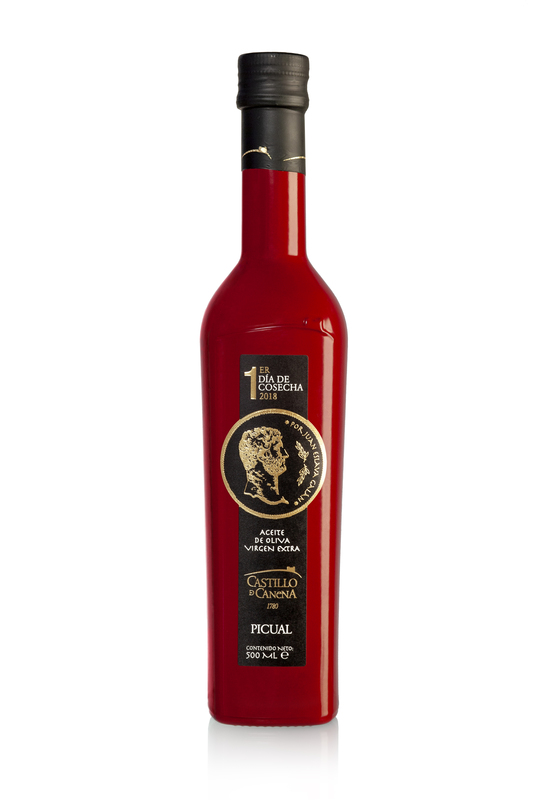 The best olives in the world, at the optimal moment of ripeness Castillo de Canena takes great care with the whole process of selection of the very best olives of the Arbequina and Picual varieties, and harvests them at the precise moment of their optimal ripeness. 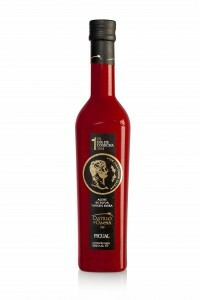 The Picual First Day of Harvest is a fragrant oil with an intense green color and a high concentration of chlorophyll. Its sensorial profile is well-balanced despite its vigorous fruitiness. It is very complex, with strong green notes: green tomato, artichoke, green almond, banana peel and fig stem. These notes prevail over a pleasant piquancy, percieved mostly in the throat, a slight bitterness and discreet astringency. This is a velvety juice, with a lingering aftertaste of menthol and wild aromatic herbs. The Arbequino First Day of Harvest is a pale green oil, bright with golden hues. Its organoleptic profile is well-proportioned, elegant, sweet, pleasant and harmonious. It offers a broad array of vegetable aromas, principally fresh grass, green almond and fruit salad, with green apple and pear standing out. It is notable for its fluidity, a discreet bitterness and piquancy in perfect harmony with the fresh sweet notes present in this juice. It has a persistent almond aftertaste with a slight touch of pepper in the throat and a mild astringency at the end. This thirteenth edition of Castillo de Canena’s First Day of Harvest line will be present in over 50 countries—principally in Europe, the United States, Latin America, Japan and Australia—consolidating its reputation as one of the best extra virgin olive oils in the world, thanks to the constant recognition it has enjoyed.